I started this last Wednesday as part of Embroidery Central’s April Fool’s all Day Sit n’ Stitch. 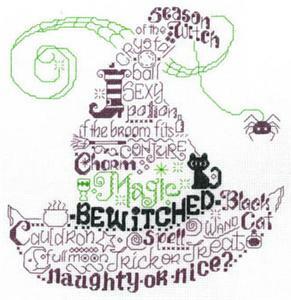 It is called Let’s Be Wicked and is designed by Ursula Michael. Ursula’s patterns are just plain fun to stitch; especially, these play on words patterns. Plus, depending on the fabric, they are a quick stitch for an intermediate or advanced stitcher. If you are a beginner, these patterns might be a bit of a challenge but they are tons of fun. Now, as you can see, I used a different fabric. For the EC event, you paid $30 to get a pattern, fabric, and one hand dyed thread or 4 DMC threads. They had a variety of patterns and fabric to chose from sitting in a basket. 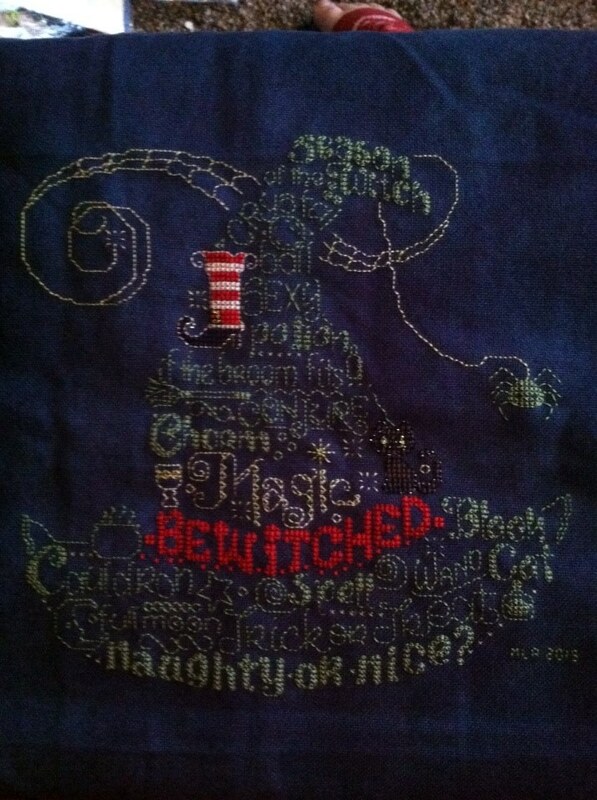 I chose to do Let’s Be Wicked on a hand dyed fabric called Gothic; I am not sure who produced the fabric. The thread changes are as follows, main cross stitch of the hat and spider DMC 368 which is backstitched with DMC 703. The lighter green/yellow is Chartreuse by Weeks Dye works. The red hat band and the witches stocking is Louisiana Hot Sauce by Weeks Dye Works. The white of the witches stocking and back stitching I think is called Linen but I can’t remember which company makes it. The witches boot was stitched in a hand dyed black that had lost its tag and it was back stitched in a Krenik sliver. The kitty cat was stitched in Charcoal by Weeks Dye Works then back stitched with DMC 310 and a Black blending filament from Rainbow Gallery. The kitty’s eyes were stitched with the Chatreuse. I think that about covers it. Happy Stitching!